"No matter how many modern parts I do, people still refer to me as Mrs. Costume Drama." Halloween is lurking around the corner and couture costume ideas are aplenty. From Marie Antoinette to a twenties flapper to Marilyn Monroe, there are numerous options for the fashion-conscious. Heidi Klum is the master of creative costumes. Over the years, she has transformed herself into Cleopatra, Lady Godiva, a crow, and a plethora of other extravagant characters. When it comes to Halloween festivities, she spares no expense. The New York Times posted an article this week on their fashion and style page about Halloween costumes inspired by high fashion. 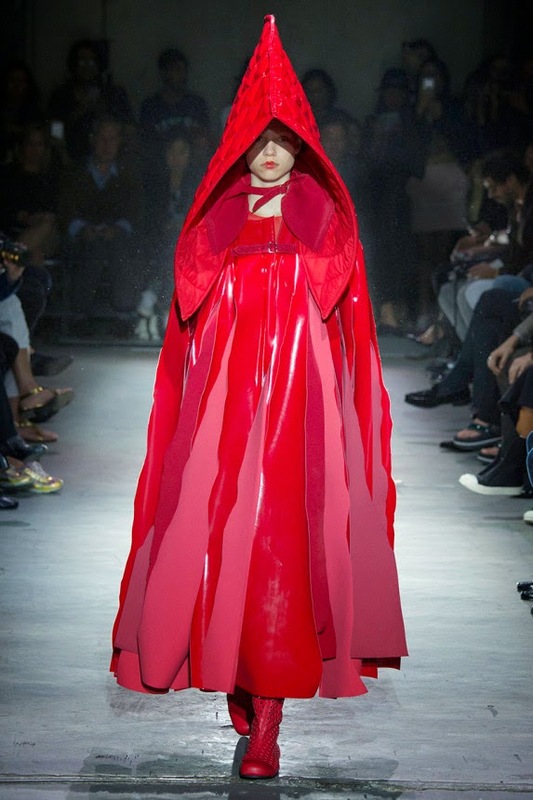 My favorite look shown on their Pinterest board is an extraordinary red hooded cape that graced the runways at the recent Comme des Garçons spring 2015 show. Little Red Riding Hood, eat your heart out. If you prefer an understated Halloween ensemble, there are many ways to pull together a chic look while avoiding an actual costume. I was recently perusing online retailers and found some great pieces that embrace the spirit of Halloween without being too literal. One of them is Alexander McQueen's black hooded cape sold on net-a-porter.com. It is a great statement piece that can be worn past October 31st without looking gimmicky (if I had a spare $2,695 lying around, I would snap it up). Another combination for the costume-shy is Michael Kors' black stretch-wool and silk-georgette gown paired with Bottega Veneta suede pumps. It screams dark and mysterious and wouldn't be out of place on Mrs. Count Dracula. My favorite Haloween-esque couture design is a skirt by Oscar de la Renta. 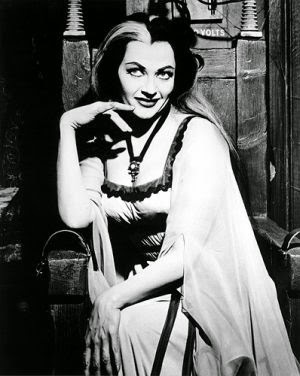 I can just imagine Lily Munster wearing it while at a gala with Herman by her side. Over the past few days, I have been on a sewing binge and designed a dress, a striped top, and a cape. I used a polka-dot wool boucle and added a bit of leather to make a dress. It was the first time I have ever bought a real leather hide and I could easily become obsessed. It was easy to work with, blended well with the wool fabric, and does not fray. 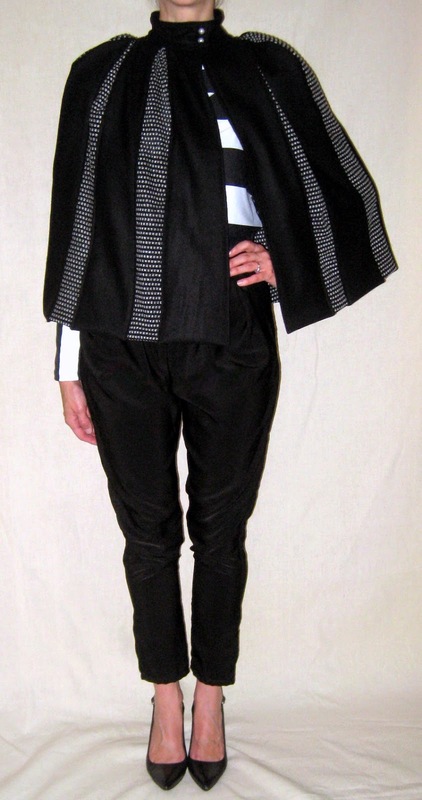 I also used the polka-dot fabric and combined it with a black camel's wool to create a cape. Then I layered it over the striped top and paired it with some pants that I made last year. The best part about these separates is that they are all interchangeable for mixing and matching. You won't see me dressed as a vampire this Halloween, but I will be donning a cape.